The Canadian city of Hamilton has the perfect location for families looking to move out of the big city of Toronto. However, its building stock is outdated and in grave need of retrofitting. Can Nordic solutions be the key to unlock affordable and sustainable housing in Hamilton? The City of Hamilton is a medium-sized Canadian city located just outside of Canada’s largest metropolis, Toronto. In the 20th century, Hamilton was well known for its heavy industry and abundance of blue-collar jobs, particularly steel manufacturing. However, as Canada’s economy and energy-mix shifted in the 20th century, the city of Hamilton has transformed into a post-industrial city. At the same time, skyrocketing housing prices in nearby Toronto means that many are looking to nearby cities for housing. Caused by these developments, Hamilton and several other Canadian cities are experiencing a number of challenges arising from an influx of new residents, rising real estate prices and the re-emergence of dense commercial districts. These challenges have created an urgent need to increase the availability of affordable and sustainable housing in Hamilton. In the face of these challenges, the City of Hamilton is initiating a city-wide retrofitting of its social housing stocks – aiming for the highest standards possible with regards to environmental sustainability and quality of life. The city itself owns a large stock of mid- and high-rise social housing blocks, 164 buildings composed of over 23,000 individual units, that they are looking to renew over the coming months and years. Moreover, there are more than 50 additional social housing buildings owned by private developers that will also have to undergo retrofitting and renewal. The goal for this Open Innovation call is to engage innovators, companies and other relevant stakeholders who work with the concrete challenges facing Hamilton’s urban renewal. We will invite selected solution owners to Canada to participate in a two-day workshop with city officials and private developers based in Hamilton. We anticipate that through an inclusive and collaborative approach we will be able to co-create relevant and innovative solutions for, and in collaboration with, the City of Hamilton. Ideally, these solutions and approaches can be replicated in other cities worldwide. With the participation of both city officials and innovative companies, this project will address the process of deep retrofitting social housing, with a focus on creating affordable & sustainable housing. The workshop will be of a ‘pre-market’ and ‘market’ nature. The delegation going to Hamilton will consist of both businesses as well as city experts and city officials from the Nordic countries. Workshops on the ground will cater to both these groups, as there will be some knowledge sharing workshops on the 10th, where the City of Hamilton will be explaining and talking about their specific challenges, and will get ideas and inputs from the Nordic city officials and businesses. After this there will be a visit to two of the social housing buildings that the city owns so that the businesses can get a feel for the reality on the ground. The next day, there will be a pitch competition, where all the businesses who will come with us will have the opportunity to pitch their solutions and approaches to the City as well as the many private developers based in Hamilton, based on both the pitch they brought with them from home, as well as their on-the-ground experiences in Hamilton. The best pitches are expected to be offered the opportunity to collaborate with the City of Hamilton and its partners with the aim of integrating their solutions and approaches in the urban renewal process. Submit your solution for a chance to present and demonstrate before decision makers at the Grand Finale in Hamilton in September 2018. Proposals accepted until 22 June 2018. The City of Hamilton is working to energy retrofit their building stock. However, building renovation processes stagnates due to a plethora of challenges, such as a lack of financing, information, behaviour change, educational materials, etc. These issues are often exacerbated within the public housing sector, where societal issues such as poverty and social exclusion are commonplace. On the other hand, public housing represents an important asset for the City of Hamilton as well as the national government, both in terms of economic and social value. By improving the quality of life and the economic resilience of their public housing tenants, local authorities may obtain long-term returns in the form of social inclusion, and citizens’ well being. Housing and buildings represent a considerable proportion of all energy-usage in Canada, equating to approximately 12% of the country’s greenhouse gas emissions. Reducing energy-usage in buildings is thereby a priority for cities. The Deep Retrofitting of housing stock represents a great opportunity to achieve this aim however, increasing energy efficiency in isolation is not the limit to this opportunity. Such an investment also represents an opportunity to achieve further municipal goals such as the reduction of building maintenance requirements, increases in occupancy well-being, increases in the value and productivity of the building, and reductions in its overall environmental footprint. To meet this challenge, we are looking for innovative building technologies and installations which will optimise energy efficiency and occupant health and well-being. 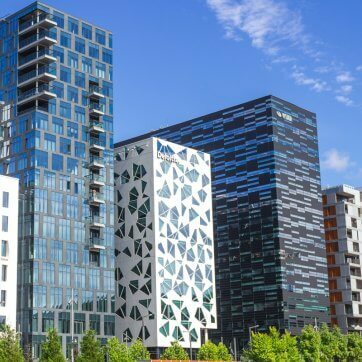 These may include, but are not limited to, smart energy, water and indoor climate management systems, innovative building façades and windows, and energy efficient lighting and heating technologies. What new materials and components are needed for deep retrofitting? And what are the lifecycles and potential for obtaining a more circular approach when it comes to the reuse, up-, down- and re-cycling of materials, and processes needed for sustainable and energy efficient retrofitting and modification? To meet this challenge, we are looking for proposals that focus on enhancing the building renovation process. This may include, but is not limited to, solutions which improve energy efficiency and management, increase liveability of accommodation, reduce the carbon footprint of retrofit activities and ensure circularity at the end of the buildings lifecycle. How is it possible to engage relevant stakeholders in decision making processes that facilitate more effective and user-centric retrofitting actions, e.g. local communities, tenants, local authorities, NGOs, local craftsmen, companies, etc.? Community involvement, a clear mandate and transparent processes are closely affiliated with sustainable solutions that create local commitment and ownership for the communities involved. To meet this challenge, we are looking for new and inclusive approaches to stakeholder engagement, ensuring that residents and other stakeholders are active in the renovation process. This may include, but is not limited to, approaches to stakeholder engagement in the planning stage – i.e. stakeholder workshops, stakeholder outreach; and communication platforms between – for example – residents, building owners, and utility providers. Tools which measure and model the environmental performance of buildings is useful in enhancing the energy efficiency of buildings through enabling targeted interventions. Further, they represent a powerful tool through which a city or developer is able to simulate and quantify the return on investment of their chosen approach. Access to accurate models and simulations enables the enhancement of the Deep Retrofit process’s entire business model, the unlocking of investment and scaling-up of the Deep Retrofit process. To meet this challenge, we are looking for decision-making and analytical tools that assist municipal planners and developers in the design phase of the city-wide retrofit process. This may include, but is not limited to, tools that identify buildings that are most in need of deep retrofit; provide simulations into building performance – i.e. energy efficiency, livability, lighting quality; and that enable accurate costing and projected returns on investment. Tools which highlight the potential of retrofit actions – i.e. provide indicators as to the value for money of retrofit actions or improvements in the buildings environmental performance post-retrofit. This on-the-ground project represents a big opportunity to bring a Nordic approach and Nordic solutions to Hamilton. Project partners Climate-KIC, Solved, Quercus Group, Global Utmaning and the International Federation for Housing & Planning aim to use this urgent demand in Hamilton as an opportunity to bring Nordic-inspired approaches to the city in the form of user-centric approaches, best practices and innovative, sustainability focused solutions. The purpose of the submissions form is to understand the nature product and or service you wish to bring to the Hamilton workshop, as well as its relevance and impacts to “Deep Retrofit” processes. We anticipate that submission process shouldn’t take more than two – three hours. Solution owners selected to participate in the workshop will receive a flat sum of €600 cover wages, flights and accommodation themselves. The latter will be available at discounted rates. Local transportation costs will be reimbursed. Additional information on the project and its objectives can be found here. The selection of finalists will take place by the 10 August and finalists will be invited to an online pitch boot camp in late August and early September to prepare for a final “market” workshop and solution demonstration at the Grand Finale in Hamilton in 13 – 14 September 2018. Proposals can be submitted from 19 March until 22 June 2018.